Samsung is ready to bring up a new line of smartphones with its new Galaxy C series. 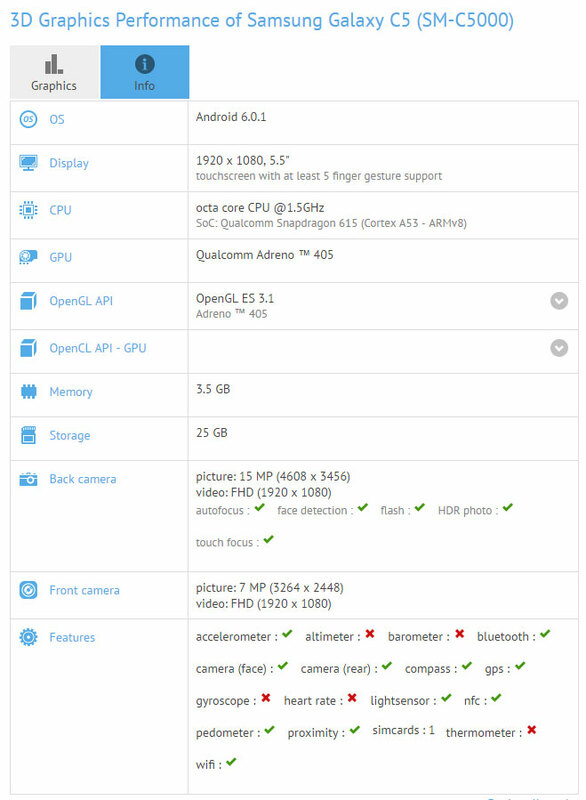 Recently we have notified that Galaxy C7 has been spotted in AnTuTu benchmark that has disclosed some of the key specifications of the device and now Galaxy C5 has appeared in GFXBench benchmark database. Galaxy C5 is a downgraded version of C7, as the name suggest. These horde of leaks confirm that Galaxy C series is very near to its release. Galaxy C5 (SM-C5000) carries a very similar specifications like Galaxy C7 expect that it is powered by Snapdragon 617 and Adreno 405 instead of Snapdragon 625 and Adreno 506. The rest of the hardware specifications are same, though as of now there is no information about the battery, so we can’t comment on that section. Surprisingly, C5 is also featuring a 5.5 inch super AMOLED display with full HD resolution similar to that of Galaxy C7, though it was expected to hold a smaller screen. On the software department, Galaxy C5 will be running on Android Marshmallow with TouchWiz UI. The device will be equipped with 4GB RAM and 32GB internal storage with an option for expansion via micro SD card. Galaxy C5 sports the same camera as C7, i.e. 16MP primary camera and 8MP front camera. It also include fingerprint sensors and 4G support. It seems that all the phones that are included in Galaxy C series will come with finger sensors and a metallic frame. The other features include Wi-Fi, NFC, Bluetooth, GPS, Wi-Fi Direct, OTG and 3.5mm audio jack. The price and availability of Galaxy C5 is still not known and it is expected that Samsung will soon disclose some official information about Galaxy C series. According to Samsung marketing trend, it is expected that the company will also release Galaxy C2, C3 and C9 similar to that of J series and A series. But we cannot verify all these information as of now. To get more updates on Samsung devices, stay tuned with us.